TMGE delivers services for the "Visual Display/Information Systems and Associated C4ISR Network Infrastructure" IDIQ contract. TMGE has and continues to perform work on multiple tasks providing services for 3 disciplines related to Video Teleconferencing (VTC) specific functions. The following disciplines are supported: 1) Both Classified and Unclassified Help Desk Support; 2) Engineering Services and Naval Video Services (NVS) Lab Support; and 3) Installation and Integration Services. Many of the Navy's teleconferences occur by linking, or bridging teleconference facilities from one side of the world to the other using the military's classified digital networks. To successfully accomplish and manage these link-ups it requires technologists with very special know-how. As a Government contractor, TMGE provides the U.S. Navy with the expertise to support this type of mission day-in and day-out, worldwide. Our staff supports the Navy's Video Teleconference facilities worldwide. It is our job to provide scheduling and configuration of audio bridges and Video Teleconferences (VTCs). Our Technicians ensure stable, reliable operations during both unclassified and classified conferences. These Technicians also have the responsibility for maintaining, troubleshooting, and upgrading all other associated equipment such as servers, workstations, gatekeepers, gateways, ISDN switches and media converters. The Help Desk Technicians are responsible for facilitating active teleconferences worldwide. Many of these teleconferences are classified connections, and occur by linking, or bridging teleconference facilities from one side of the world to the other using the military's classified digital networks. To successfully accomplish and manage these link-ups it requires technologists with very special know-how. As a Government contractor, TMGE provides the U.S. Navy with the expertise to support this type of mission day-in and day-out, worldwide. Our staff supports the Navy's Video Teleconference facilities worldwide. It is our job to provide scheduling and configuration of audio bridges and Video Teleconferences (VTCs). Our Technicians ensure stable, reliable operations during both unclassified and classified conferences. These Technicians also have the responsibility for maintaining, troubleshooting, and upgrading all other associated equipment such as servers, workstations, gatekeepers, gateways, ISDN switches and media converters. TMGE provides support to perform Engineering, Technical Support, Integration Services and Life Cycle Management Services on the Naval Video Services (NVS) Lab Systems Infrastructure. The NVS Lab is used as a beta test facility to introduce all aspects of new technology, germane to the Navy's video teleconferencing disciplines. As new products; hardware, firmware or software, are being introduced to the market, the original equipment manufacturers (OEMs) will schedule time at the NVS Lab. The Lab provides the OEMs the ability to perform integration and testing in an environment that is configured with the existing suite of products currently being used in support of the VTCs for the Navy. 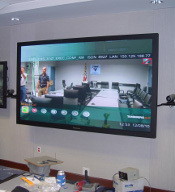 As a Government contractor, TMGE also provides the Navy an engineering team that performs the installation and integration functions necessary to establish new, renovate existing, or enhance the Navy's Video Teleconference facilities worldwide. These Navy facilities include conference rooms, Command and Control rooms, offices, briefing rooms, theaters, training rooms and campus-wide systems.